If you’ve been purchasing day-old baby chicks or buying young birds instead of hatching your own, then let it be known that you’ve been missing out on half of the adventure! There is nothing like the joy of picking out breeds, waiting patiently for 21 or so days (see ‘how long does it take a chicken egg to hatch‘), seeing veiny embryos during candling, and finally hearing the first tiny peeps from emerging hatchlings. Being able to bond sooner and better with your chicks – This means that they will be more tame and friendlier as they have been hearing your voice even from inside the shell. Even breeds that are not inclined to be friendly will have a better disposition towards you. Hatching chickens that are less flighty and nervous – Because your birds have had the opportunity to see you from the beginning, they will be less flighty and anxious than birds that are shipped to you days old. Being able to choose rare breeds and unusual colors – When purchasing eggs from breeders, you get the chance to choose specific breeds that you may not be available as juveniles. And of course, as cheesy as it may seem, hatching your chickens on your own reconnects you to the cycle of life. It’s truly an awe-inspiring experience that never fails to amaze guests, children, friends, and family. Incubators are used for artificially hatching eggs when you don’t have any hens to keep the eggs warm. An incubator re-creates the conditions that are needed to hatch eggs such as warmth, humidity, and ventilation. The first thing you need to do is buy an appropriate model. Remember that you get what you pay for so you don’t want to get the cheapest one. Another really important thing to keep in mind is that you will need the instructions for your incubator to be successful. Different models of incubators work differently so it’s very important to keep the instructions. If it didn’t come with instructions then look up the serial number and look up the instructions online; this is very important! You may want to spend a little more on an incubator because some have digital controls. An older incubator will have manual controls and that means having to constantly keep track of the ventilation, humidity, and temperature, whereas a newer model does not require constant monitoring. 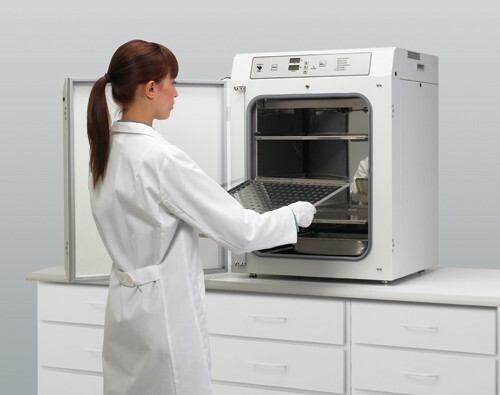 Styrofoam incubators – These are the most affordable models. You can put 4 dozen at a time. The down side is that the success of the hatching 100% rests on you as you control temperature and humidity manually. For 21 days, you will not be able to go anywhere since you need to turn your eggs over every few hours during the day (unless you get someone to cover for you). Home incubators with some automatic features – A tad more expensive, some manual incubators come with a turner and fan. In this setup, you won’t need to turn your eggs manually and the fan keeps the temperature even inside. However, you will still need to monitor and adjust temperature and humidity constantly. Fully automated incubators. These are the most stress-free to use. These automatic incubators turn eggs on schedule, countdown till hatching day so they stop turning at Day 18, and control temperature and humidity. You’d only need to worry about power failures. If you want to challenge yourself, you can also build your own incubator. Many universities and websites offer free guides like this tutorial for a “Matilda”, an inexpensive electric incubator. You need to make sure to clean the incubator thoroughly before using it. This is very important because diseases can be transferred through the eggshell to the developing embryos, and little embryos are very sensitive to diseases. This cleaning process is especially important if you have bought a second hand egg incubator. You need to vacuum the inside and outside of the incubator to remove any dust and dirt. That’s not enough though because you also need to use a wet cloth soaked in a diluted bleach solution to kill any germs. Be sure to wear gloves when doing this to avoid having the bleach burn your fingers. When this is done let the incubator air dry before use; air drying is very important because cloths or towels have contaminants and dirt on them which will completely defeat the purpose of cleaning it in the first place. You need to choose an appropriate location for the incubator. You don’t want the incubator to be in an area where there is ventilation of air flow because that will mess with the temperature of the incubator. The incubator needs to be in a place that has a steady temperature between 70 and 75 degrees Fahrenheit. To repeat, the incubator needs to be in a place that is room temperature and does not experience any windy drafts. Plug the incubator into an outlet where you know that it can’t easily unplug by itself. Also plug the incubator into an outlet that is far away from prying fingers and little children that might unplug it. This is very important because if the incubator is unplugged for an extended amount of time then the eggs might not hatch. The next step is to add some warm water to the incubator’s humidity pan so that the eggs will have the moisture necessary to develop. Read the instructions of your incubator to find out exactly how much water is needed. Calibrate the temperature of the incubator at least 24 hours before using it to ensure that it is stable. The temperature of the incubator needs to be between 99 and 102 Fahrenheit. This is very important because if the temperature is too low then the eggs will never hatch and if the temperature is too high it will kill the embryos. Remember to check the temperature after 24 hours before putting the eggs in the incubator to make sure that the temperature doesn’t fluctuate. In order to be able to hatch and raise a healthy flock, you should start with the procurement process. You not only ensure good genetics, you also improve the chances of a successful hatching. Eggs from your own hens. If you already have your own, choose eggs from your healthiest and friendliest chickens. Eggs from a local breeder. Visit a breeder in your area and ask for extra fertile eggs that he can give or sell to you. From online listings. Websites like eBay or Craigslist sell hatching eggs but make sure that they are NPIP certified. An NPIP certificate will ensure that they have been tested for diseases that can be passed from mother hen to egg. From breed clubs in your area. If you want to hatch a specific breed that is not too common, get help from a breed club. They will have a list of breeders that can ship eggs to you for hatching. Eggs from rare breeders. This option is only for those who want specifically rare and unusual breeds. We’d recommend you get more experience under your belt before taking on expensive eggs. Buying eggs from a distant source where you will have to ship. When eggs undergo the rigors of shipping, you bring your chances down to 50% in contrast to 80% for eggs that have not undergone shipping. Buying eggs from groceries. They are most likely not fertile as they would be old and would have undergone shipping. Still, there are stories of chicks hatching from grocery eggs. Just be prepared for whatever breed or cross comes out (and if they come out highly-strung!). Before you touch the eggs to put them in the incubator make sure that you wash your hands thoroughly to rid them of any contaminants. Your hands contain a lot of bacteria and you don’t want those getting on the eggs. Before placing the eggs in the incubator let them heat up to room temperature over a period of time. Quick temperature fluctuations are really bad for the eggs so you don’t want to place cool eggs into a warm incubator. You need to mark the top and bottom of the eggs with a symbol of your choosing so that you can keep track of the flipping. The eggs need to be turned roughly 3 times per day ad these symbols will make it easier to keep track of. Gently place the eggs in the incubator and be sure to place the eggs on their sides. The large end of the egg needs to be a little bit higher than the thinner side. This is because if the thinner side is up higher, the embryos can become misaligned and the chicks may have trouble piping and breaking through the shell. Also be sure that the eggs are evenly spaced and not too close to the heat source. The temperature of the incubator will drop a little bit after you have added the eggs. Don’t try to compensate by turning up the heat, simply let the incubator take its time to get back up to heat. This is to avoid fluctuations in temperature. Remember to write down the date and the time of day at which you introduced the eggs to the incubator. This is so you can know roughly when they will hatch. You need to turn the eggs about 3 times per day in order to counteract the effects of temperature fluctuations and to mimic the motion of a hen. When you turn the eggs check them to make sure that there aren’t any cracks, also try to re-arrange the eggs so that they pass through all of the spots in the incubator. You don’t have to turn them in the last 3 days because the birds are almost ready to hatch. The incubator needs to be at around 50 percent humidity, and that needs to be raised up to 65 percent in the last 3 days. Use a special measuring tool to measure the humidity and always remember to re-fill the humidity pan with water. Make sure to add water regularly and make sure that it is warm water. Make sure that your incubator has spots on the sides and the top where air can flow through. It shouldn’t be windy but there should be adequate ventilation. You need to candle the eggs about 7 to 10 days after the beginning of incubation to see how far the embryos have developed. Use a tin can or a box that is smaller than the egg so that the egg can rest on top of it. Put the light bulb under the box or tin so that light shines through the egg. You should be able to see cloudy mass which is the embryo developing. If the egg appears clear then your egg has not begun to develop. If you have any eggs that aren’t showing signs of developing you can remove those because if they haven’t started developing after 10 days then they probably won’t. Prepare for the hatching date by stopping the rotation and turning of the eggs 3 days before the expected hatching date. Place a cheesecloth or some other type of cloth to catch the egg shells that fall down during the hatching process. During the last 3 days you want to turn the humidity up to around 65 percent. Once you are in the last 3 days don’t open the incubator until the eggs have hatched. Wait until the chicks are completely dry before moving them to your prepared area. Removing them before they are dry may cause the chicks to become too cold. And that’s it; incubation from beginning to end! Don’t forget: Shipped eggs have an average success rate of 50%. Unshipped eggs have a success rate of 80%. So, don’t hatch fewer than 6 eggs if your eggs have been shipped. You’ll either have no chicks or you’ll have one or two who may just die from loneliness. The temperature for still-air incubators should be 101.5 while forced-air incubators should be at 99.5. Set your humidity to 40-50% on the first 18 days. On the 18th day, raise to 70%. Use a hygrometer for an accurate reading. When measuring temperature, measure from the top of the egg. Turning eggs three times a day is good. Five is even better. You can date your eggs with a pencil if needed. Some breeders also mark each side of their eggs with an X and an O, especially if you are turning your eggs manually. Avoid opening the incubator unless absolutely necessary. The fewer fluctuations in temperature and humidity, the better. Place rocks at the bottom of your incubator. They serve as heat sinks when you need to lift the lid of your incubator. If you notice any cracked or bad eggs during candling or rotation, immediately take them out. They might explode inside the incubator and infect the other eggs. NEVER attempt to help a chick out of its shell. You will risk the chick bleeding to death. Expect 5 to 7 hours (or even 24 hours) before a chick can come out of its shell. Wait around 4 hours for your chicks to dry completely before moving them from your incubator. Otherwise, they will get chilled and get sick. Hatching your own eggs requires patience and dedication. Sometimes, you get the dreaded bad batch wherein very few hatch especially if you were not too careful in getting your eggs or too diligent during incubation. When your beautiful fertile eggs don’t hatch, you’ll have to play the role of a forensic pathologist. Open your unhatched eggs outdoors to understand the cause of death.